March 16, 2017 – Six Flags New England announced that Mind Eraser is becoming Galactic Attack Virtual Reality Coaster, the world’s first “Mixed Reality Experience” on a roller coaster that combines Augmented Reality using the Samsung Gear VR’s passthrough camera functionality along with virtual content. Through the first portion of the ride the headset’s passthrough functionality makes riders aware of their surroundings, by allowing them to see the “real world,” including the person seated next to them as well as a heads up display overlay that will show data like current status of weaponry, time codes, fuel cells, and a countdown clock. Cresting the lift hill, a massive, swirling wormhole comes into view before riders are swept into a full on VR space battle that offers three different endings. This spring the park’s Vekoma SLC will also feature trains that are being outfitted with new restraints to make “a more comfortable, smoother and exhilarating ride experience than ever before”. Read more about this mixed reality experience coaster in our VR Thread Forum discussion. 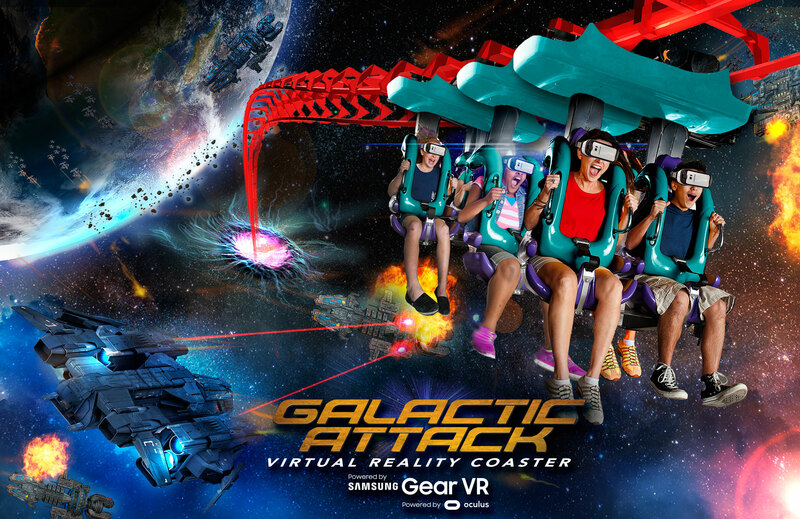 This entry was posted in News and tagged Galactic Attack, Mind Eraser, New England, Six Flags, Virtual Reality, VR. Bookmark the permalink.